In keeping with the age-old Meraki philosophy of empowering our customers to do more with less, people-counting analytics on MV12 has finally arrived! We’re excited to see this new set of tools build on top of an already impressive (and necessary) security product. Now, MV12 can act not only as a great security camera, but also as a sensor for businesses big and small — no servers or extra infrastructure needed. If you’re already familiar with our wireless product line, this rollout might feel reminiscent of our WLAN Location Analytics tool, and it should! At Meraki, we love the notion of providing our customers more intelligence with less infrastructure, an idea especially apparent with MR and now MV. Using the advanced processor on our recently launched MV12 security camera, and built-in, anonymized person detection (not to be confused with unique facial recognition/identification) software, video is stored and analyzed on-camera, at the edge. This metadata is sent to the cloud and aggregated into people-counting metrics independently of the video itself. Plus, over time this software will become more accurate using machine learning. To see this functionality in action, just click on the ‘Analytics’ tab for an individual camera and select the time resolution (minute-by-minute, hourly, or daily) and timeframe of interest. The ‘People count’ section of this page shows an at-a-glance overview of your busiest time period, estimated peak occupancy over that period, and the total number of entrances. Remember that the ‘Total Entrances’ value will double count individuals if they leave a frame and then return, since this data is anonymized. Consequently, we encourage thoughtful placement of cameras intended for use as sensors to minimize both double counting (place them in an area with restricted traffic flow moving in one direction, like an ‘Entrance Only’ door) and occlusions (where two people or objects pass in front of one another, making it difficult for the camera to see what’s going on). 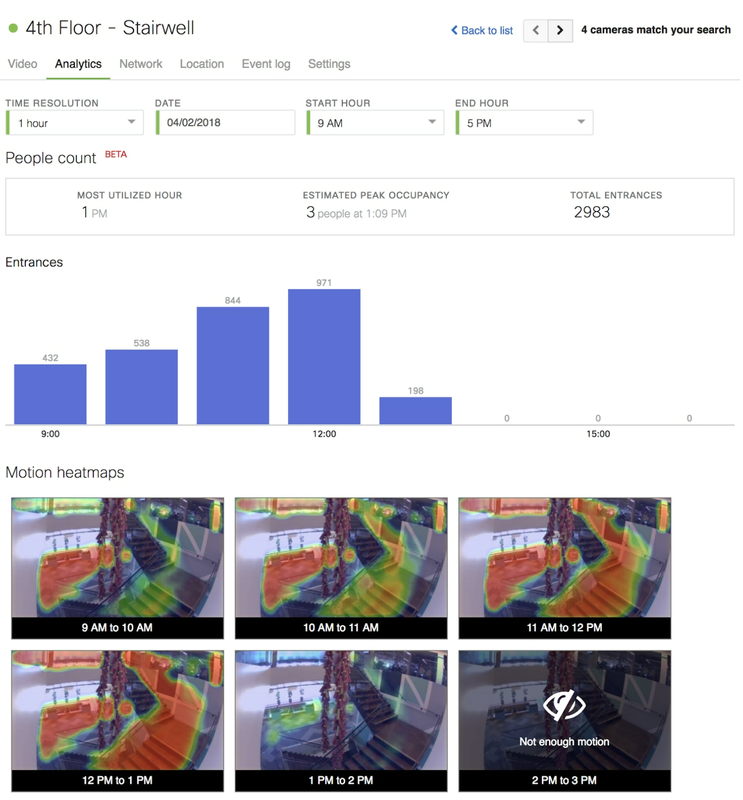 Clicking on the ‘Most Utilized’ and ‘Peak Occupancy’ results will jump directly to that moment in the camera’s historical footage so you can quickly analyze what events may have driven that spike in traffic. Drilling down into each bar in the people counting bar chart will also take you to the corresponding piece of footage, making it simple to investigate anomalies. You’ll now be able to observe and quantify granular foot traffic patterns through a given frame. For retailers: monitor the ebb and flow of customers throughout the day, optimize staffing headcount to make sure your customers get the attention they need, and increase the efficacy of marketing campaigns by targeting days of the week with the greatest or least traffic. In schools: track general attendance patterns, see which areas of campus are used most frequently, and make a business case for updating facilities and equipment based on usage patterns. At offices: figure out whether it makes sense to add more common spaces, or repurpose these areas based on popularity with office-dwellers. And are those pricey espresso machines actually getting used anyway? Of course, these examples represent only a fraction of the uses cases now available with this additional functionality. Coupled with motion heat maps (available on all MV models), it’s never been quite so easy to see the big picture quickly. Does this mean my MR Location Analytics setup is now redundant? Definitely not! Think of these tools as complementary. Because MR access points count mobile device wireless signals throughout a wireless network, they provide a broad “macro” level view of foot traffic through, say, an entire store location. People counting on MV only tabulates traffic within that visual frame, making it more accurate on a “micro” level, like an individual product display within that store. By pairing these two features, you can quickly gain insights across multiple levels of your business. Learn more and see a live demo by signing up for an MV webinar or get in touch with your Meraki rep to try MV12 out for yourself.